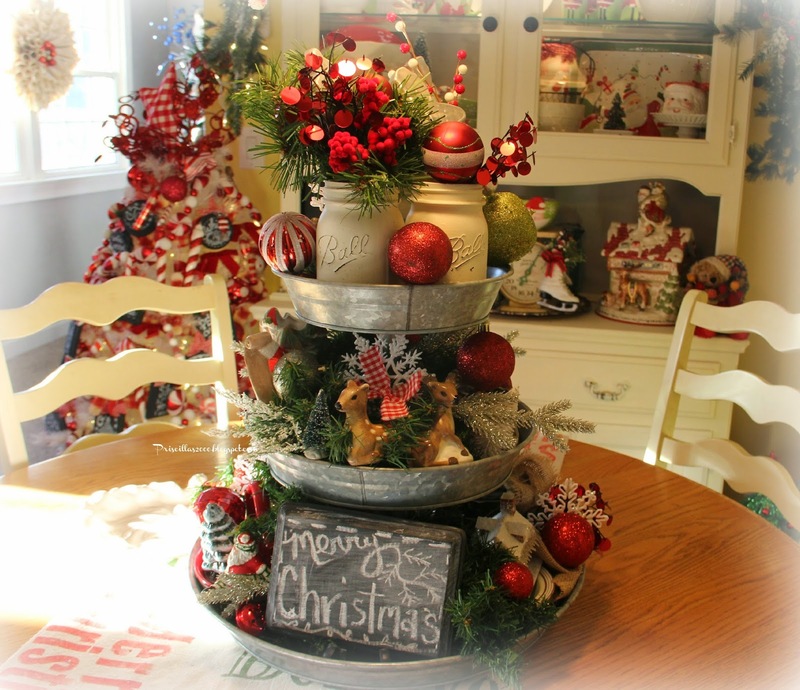 I am still loving decorating the galvanized tiered tray I got at Sam's Club for the seasons ..It sits on our kitchen table on top of the Christmas Subway Art Table runner.. 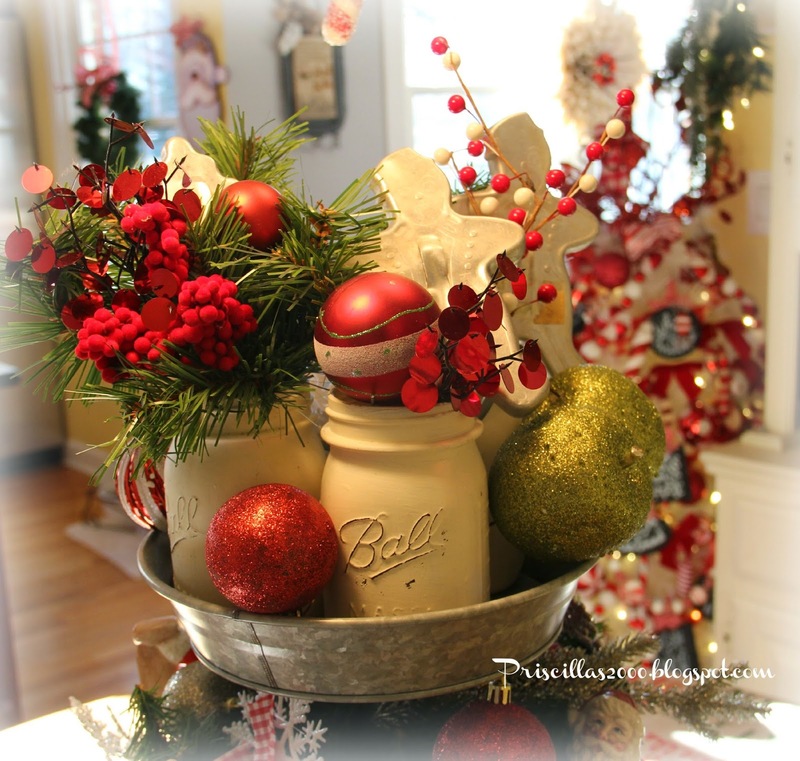 Painted mason jars filled with evergreen picks, red berry and sparkly picks and vintage cookie cutters that are from my childhood.. ..
Ornaments from the Dollar Tree are great fillers..
A board painted with chalkboard paint sits in the center with its Merry Christmas message.. The Christmas Village got finished last night so hopefully tomorrow you will see it here ! It is huge ! 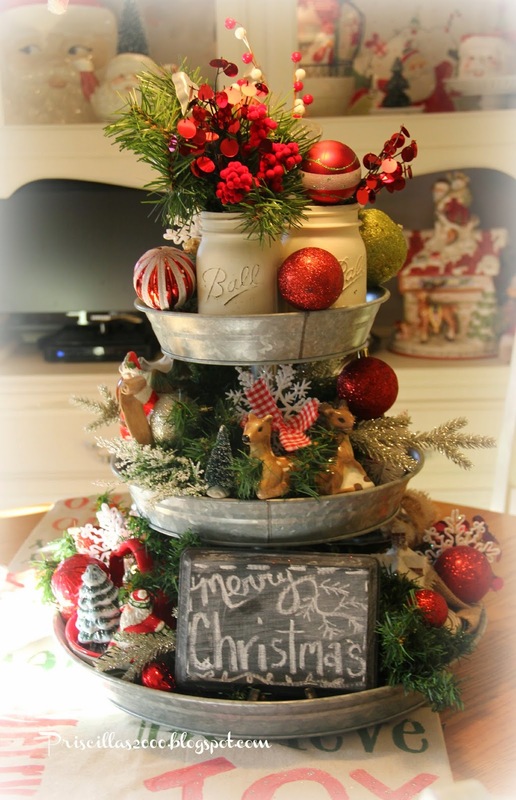 Love your centerpiece and I shared it on FB! You are so crazy talented and I can't wait to see the rest of your decorations! Good morning Priscilla. I am all tucked into my warm bed, flannel sheets, and hot coffee, enjoying the posts this morning, of my peeps. 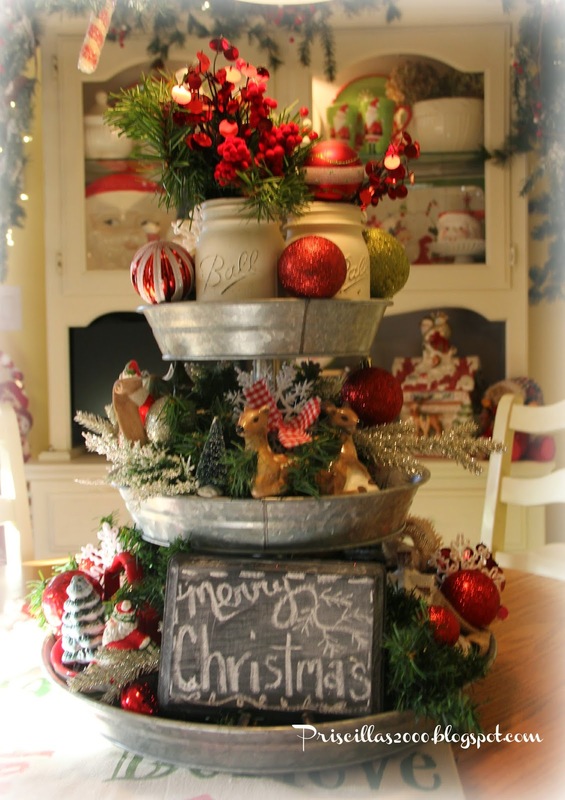 Love that tiered tray too. Is that set of deer F&F too? Love them!!! 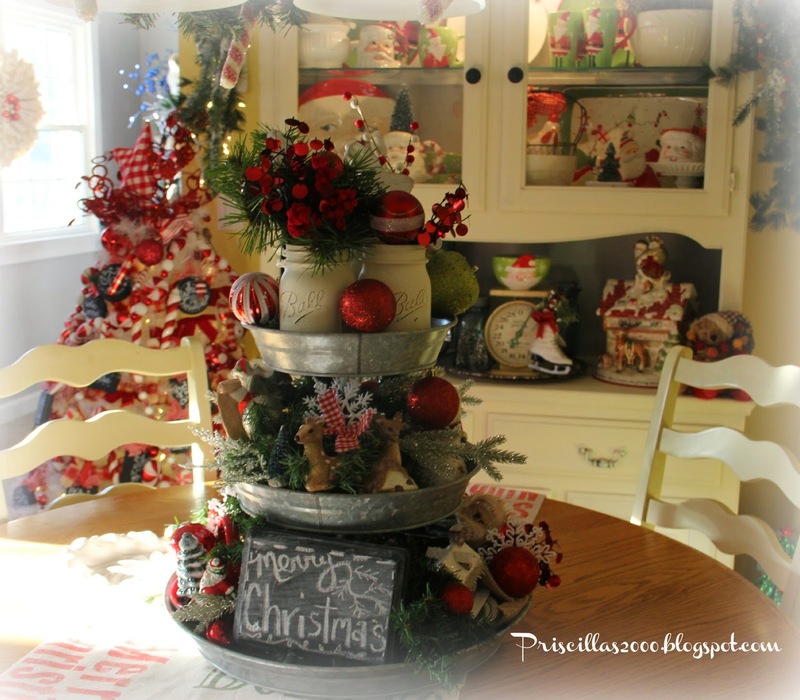 I don't decorate for Christmas until after Thanksgiving, and it will be simple this year. We have Erika and Noah here, as well as our son. A full house!!! Lots for this Mama/Grandma to do. Since I have moved my sewing room into my living room, I lost the spot where we put the tree. I am going to put it in the kitchen, where my dining table used to be. What a great center piece. 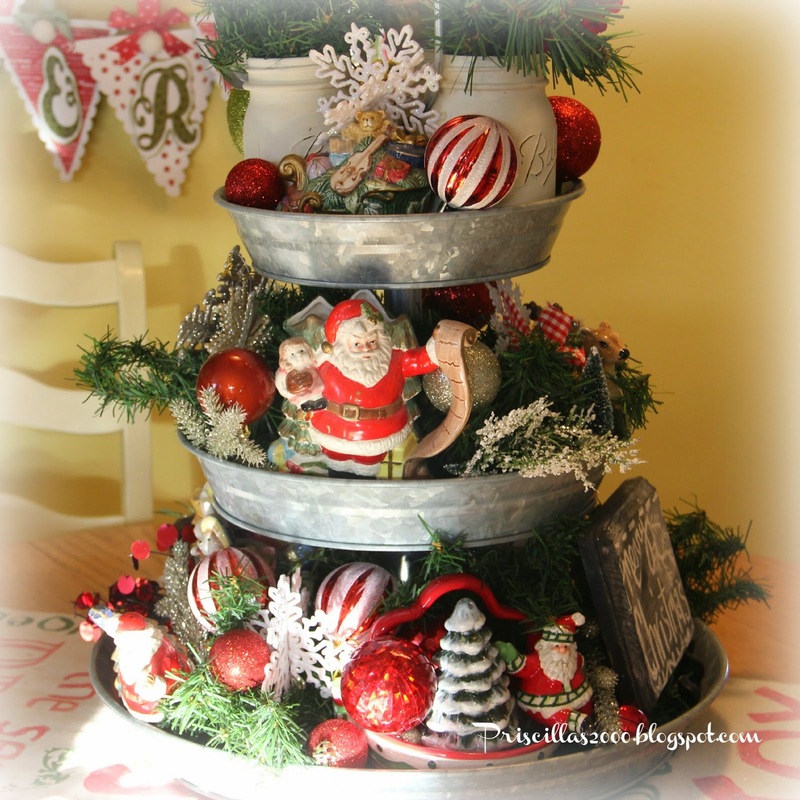 A wonderful centerpiece and I agree about the Fitz and Floyd Santas. This is a great post with memories and cheer. 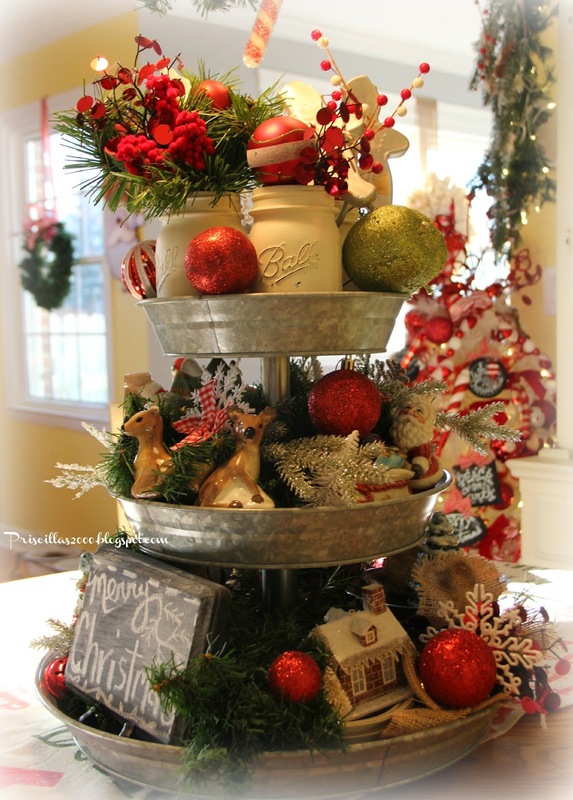 I looooove the tray used as a centerpiece. 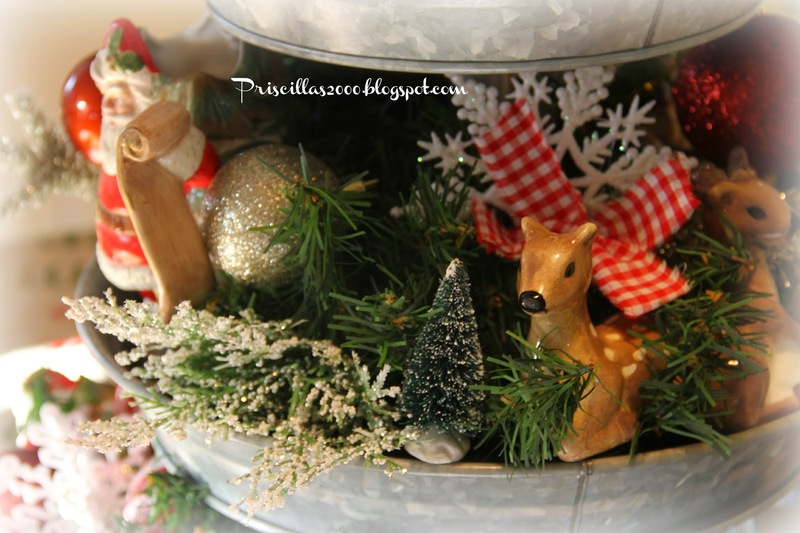 I love all your decoration. What fun! Oh my word, I love it, so pretty. Thanks tons for linking to Inspire Me. 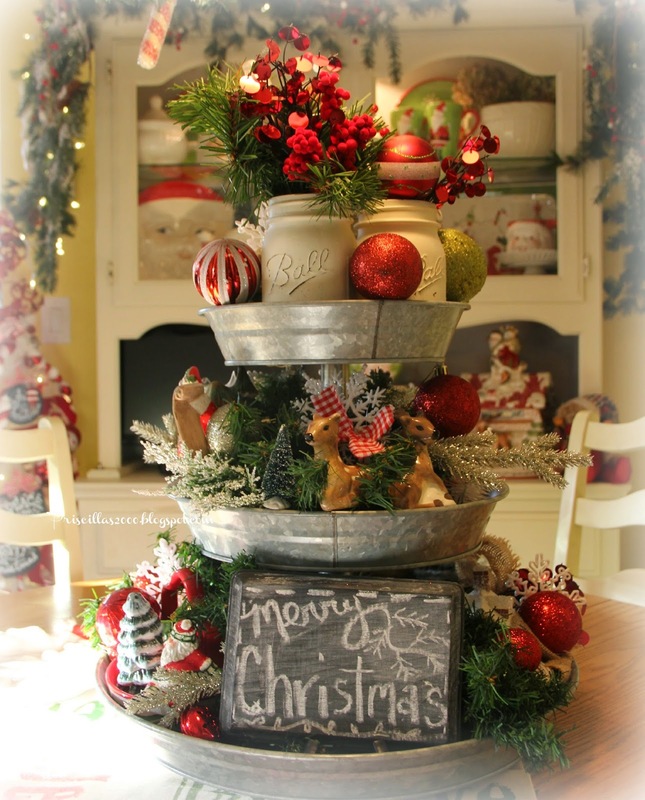 I love the tiered decorations. A little piece of Wonderland. It's just darling Priscilla! I need to do something cute with my deer this year. Thanks for sharing with SYC. Priscilla, visiting from Cindy's Dwellings, where your tiered tray was featured. Oh my goodness, how incredibly fun-filled it is! I'm, looking forward to seeing more of your flair! I love Christmas. Thanks for sharing!